Between this blog and my feature over at Fanboy, I think I’ve come out as an avid roleplaying gamer at least half a dozen times. For some reason, it still feels like this weird, shameful secret. Probably because it sort of was back before the internet let everyone know that no matter how odd the hobby, there was a vibrant subculture that was at least as militant about it as you were. You like to put oxen on trampolines? Awesome, there’s a name for that. Microbrewer who likes to dress up as personifications of Jungian archetypes? They have a website. At this point, confessing to tabletop gaming is about as strange as admitting you have a breathing addiction. Roleplaying was essentially on-the-job training for my present career. I spent a lot of time creating characters and telling stories. By the time I started writing books, I already had a couple decades of spectacularly unfocused practice. I have mined my games for characters in previously published work. Vassily “the Whale” Zhukovsky was a ghoul in my Vampire game, while Heather Marie Tooms was originally a dude and my character in a short-lived Hunter game. 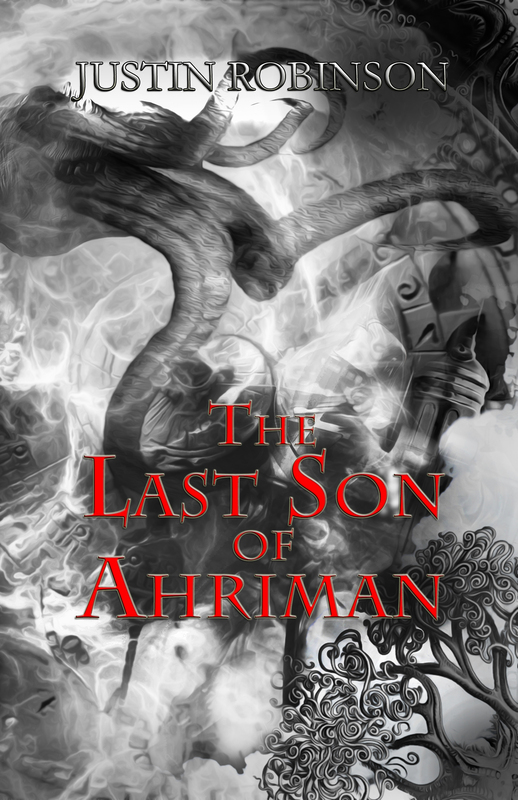 Nothing I’ve written has quite as strong a connection as my most recent novel The Last Son of Ahriman. When I was given the opportunity to join a long-running already-in-progress Champions game, I wanted to play a character that drew on my favorite parts of ‘70s comics, specifically horror, cosmic power, and dark, gothic heroes out for revenge (there’s an issue of Rom Spaceknight that bridges this gap perfectly, and is one of the Rosetta Stones of my aesthetic). Cosmic horror was pioneered by Lovecraft, and yes, I am a huge fan of both his work and the RPG it spawned. I took these ideas and created a magical hero whose power source was the very Outer God he was sworn to fight. Fighting fire with fire is one thing. Fighting Cthulhu with Cthulhu is another thing entirely. Because of the versatility of Champions, I was able to do some weird stuff. My favorite was a semi-uncontrollable telekinesis that was actually a swarm of shadow gremlin things who liked to cause as much trouble as they could. This made it into the book largely intact, because, come on. I’m only human. In fact, a lot of it did. After writing The Dollmaker I was looking for something a little more lighthearted. Of course, there are puppy funerals that are more lighthearted than Dollmaker, so this tale of a boy orphaned and forced to take his brother’s birthright to restore his sister’s soul qualified. I intended Last Son as a comic book novel (hell, the title references one of Superman’s nickname). While it has horror elements, I was a bit surprised when its eventual publisher straight-up called it horror. But my horror is the black tar heroin of the genre, so anything less doesn’t quite cut it. I thought that this story of a high school kid would be a fun change of pace, and let me explore this YA thing I’d been hearing so much about. I decided the best way to approach it would be to write the kind of book I would have wanted to read at 14-16. While Simon’s origin story in the book was the same (he got a name change, though, because I used that character’s name elsewhere), I knew I had to give him a supporting cast. Photon, Multiman, and Densiton weren’t going to be around. Also, selling the idea of superpowers and cosmic horror was going to be a bit of a problem as well. So I complicated it from a character standpoint by giving him a supporting cast, and simplified it by making all other superpowered characters into mages. I don’t remember if the idea of the Fallen Mages was in the original Champions character. I want to say yes, but I created him something like fifteen years ago. You could tell me I originally gave him Arby’s based powers and I’d at least entertain the thought. I know that the conception of the Order of Ahriman came from seeing The Empire Strikes Back when I was little. Yoda’s warnings about the Dark Side, both that it was easier and that a single slip-up would forever turn you evil, pretty much haunted me since hearing it. Empire was the first movie I ever saw in the theater, though I was much too young to really understand what was going on. Apparently, a lot of hands were cut off in preschool games of pretend after that. So this idea, that Falling was incredibly easy and almost a good idea gave me the drama. Ahriman, which was who was I now calling the star/planet/god now (Zoroastrianism, you know, for kids! ), was a known threat. The only ones who could stand against it were those who siphoned its power to fight it, and summoned monsters from it. They were also ticking time bombs ready to transform into Darth Vader at a moment’s notice. It would be easy for the other mages in the world (part of the origin, as the founder of the Order of Ahriman was some other kind of mage before figuring out how to link himself to Ahriman) to think that the cost outweighed the benefit. We see a little of them in the first book, and we’ll see a whole lot more in the second (already in second-draft form) and the third. Simon was a challenge to write, and I’m not sure I entirely succeeded. He’s lost his parents and his older brother — who he worshiped but also resented in that way only younger siblings truly understand — and he’s accidentally bound himself to an Outer God. He’s consumed with grief at the same time an insane monster is infecting him with evil. Plus, he’s kind of awful. I’m hoping that the change he goes through, from being too wrapped up in himself on the way to being a hero is a real one, and I hope that people will stick with Simon through his early dickishness to the end. When I originally outlined the series, I identified three goals for Simon. The first was restoring his sister’s soul. The second two are the basis of the second and third books. It felt organic to do this kind of trilogy, writing the book I wish I could have read then. The irony is that while I couldn’t have read it, Simon as a Champions character was only a few years away. This entry was posted in Level Up, Moment of Excellence, Nerd Alert and tagged Liner notes. Bookmark the permalink.